Welcome to the guide. Please use the menu on the right to navigate. When it comes to defending your kingdom, you settle at nothing to protect it. In Magic Rush: Heroes, players take on many hats and assume various responsibilities to ensure the safety of the kingdom. 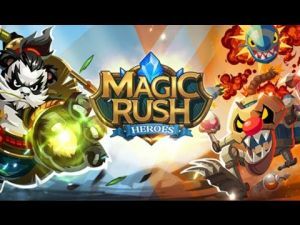 Magic Rush: Heroes goes beyond the norm as it works on a variety of gameplay modes--real-time strategy, Tower Defense, PVP, and even role-playing. But the main thrust of the game rests on the idea of having a uniquely strong line-up of Heroes ready to take up the call to protect the land. Every Hero's skills and attributes can be adjusted as players level up. For every Campaign, players may customize their own Hero Line-up to match their current battle strategy and enemy. In addition, Magic Rush: Heroes a whole lot of different ways to interact with players from all over the world (Arena and Alliance), try their luck at crafting their weapons and equipment, and perhaps even try their luck at the daily Spin Wheel and Sign-in Events.